Our new online home for Woodsmith Store has now become store.woodsmith.com (instead of woodsmithstore.com). Please update your bookmarks accordingly. Thank you! Take online classes with our expert woodworkers. 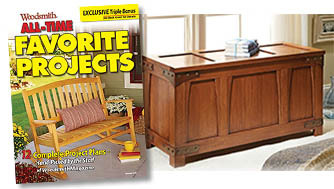 Get downloadable woodworking plans with step-by-step instructions for specific projects. 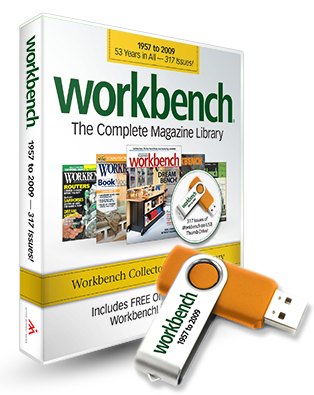 Browse and purchase digital back-issues of Woodsmith magazine. 40 Years (240 issues, including all of 2018). Every issue of Woodsmith Magazine on one computer USB thumb drive! 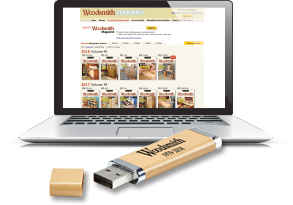 40 years of Woodsmith magazine, Issues 1–240, now on one computer USB thumb drive. It’s fully searchable and printer-friendly. Thousands of plans, tips & techniques at your fingertips… instantly! Steel shop rules with acid-etched graduations that won't wear off. Handy center-finding rule on one face. Attend live online Woodworking classes taught by the cast of the Woodsmith Shop TV show. 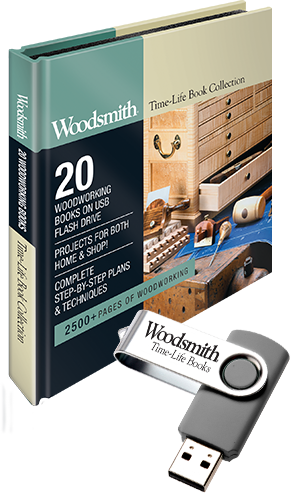 20 custom woodworking books from the editors of Woodsmith magazine on one USB flash drive! Over 2500 pages of projects, tips & techniques. Each book is packed wtih full-color photos, easy-to-follow instructions, and clear step-by-step illustrations. Each Season includes all 13 episodes originally aired on public TV. Special savings when purchasing the Collector's Edition. 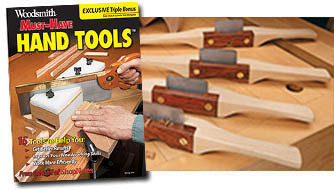 Includes CD-ROM with valuable Woodsmith plans and videos. Individual seasons also available. Now you can own America's original DIY magazine in its entirety, every issue dating back to 1957. It's your personal vault to 53 years of projects, tips & techniques - 317 issues! 23 years of ShopNotes magazine, Issues 1–138, now on one Computer DVD. It’s fully searchable and printer-friendly. Every plan, every tip & every shop-tested technique at your fingertips… instantly! -DVDs $14.95 each or get the 3-DVD set for $29.95, like buying two and getting one free! 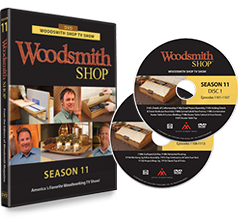 Season 11 of the Woodsmith Shop TV Show on DVD! Each Season includes all 13 episodes originally aired on public TV. Includes CD-ROM with valuable Woodsmith plans. Special savings when purchasing the DVD collection. We've written a book to help inspire you to convert that old disorganized garage and chaotic basement into fresh new spaces. Top Video Tips from the Woodsmith Shop TV show. On-screen menu of tips categorized for quick and easy access. Favorite articles and shop projects to help you get the most out of the number one tool in your shop - your router! Plus, ideas for organizing and storing your routers, bits, and accessories. Inside are 20 valuable and low-cost shop upgrades like a drill press table, double-duty planer sled and a sturdy workbench. You also get planes for custom layout tools, plus 4 smart workstations. Money-saving upgrades for your table saw and router, plus innovative shop-built tools guaranteed to improve your results. Learn favorite techniques from the Woodsmith editors using these add-ons. Get a full year of ShopNotes magazine in sturdy, hardcover volumes. Six back issues in each volume. 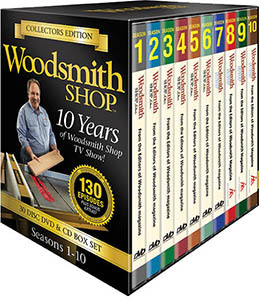 Get a full year of Woodsmith magazine in sturdy, hardcover volumes. Six back issues in each volume. 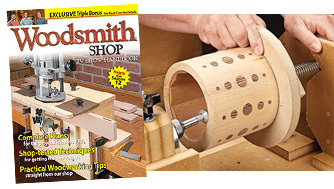 Subscribe to Woodsmith magazine and get a FREE book, Our Best Shop-Tested Tips & Techniques!